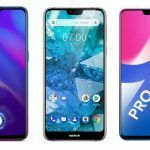 The Nokia 7.1 Android One smartphone has received a price cut. It is not immediately clear if the price cut is permanent. Moreover, the significant reduction in selling price isn’t visible across the platforms on which the Nokia smartphone sells. 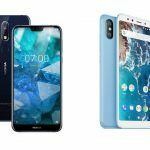 The Nokia 7.1 Android One handset launched quite recently. 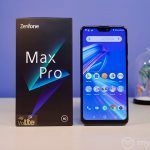 The capable mid-range smartphone sported an inaugural price of INR 19,999. However, the device now reportedly sports a substantially discounted price tag of INR 19,099. The Nokia 7.1 started selling in India earlier this month. 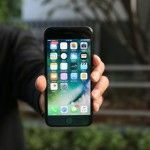 The device was offered to interested buyers through a pre-order system. It is important to note that it is only the Indian e-commerce platform Flipkart that is currently selling the Nokia 7.1 for INR 19,099. Moreover, the INR 900 discount may not be permanent. Incidentally, the Nokia handset is also available offline in physical retail outlets. Nokia‘s vast network of dealers across India have the Nokia 7.1 for sale. The Nokia 7.1 ships in a single memory configuration of 4GB RAM and 64GB internal storage. The capable mid-range Android smartphone is available in Gloss Midnight Blue and Gloss Steel color options. It is important to note that only the Gloss Midnight Blue color variant of the phone appears to have received the price cut on Flipkart. The Gloss Steel color variant of the Nokia 7.1 is selling at INR 19,650 on the website, which is lightly less than original retail price. In addition to the surprisingly deep discount of INR 900, Flipkart also has quite a few attractive offers. Buyers using SBI Credit Cards can get 10 percent instant cash discount. There’s a five percent discount on Axis Bank Credit Card when the device is bought through EMI option, and an extra five percent off for Axis Bank Buzz Credit Card users. Besides Flipkart, the Nokia 7.1 is also available on the official Nokia e-Store. 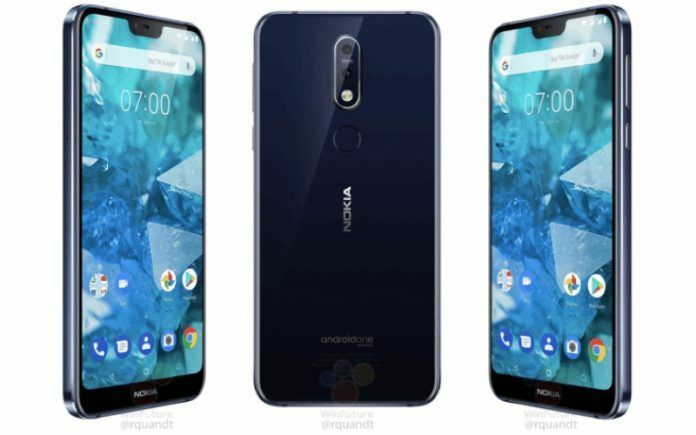 The Nokia 7.1 is a capable mid-range Android One smartphone from HMD Global. 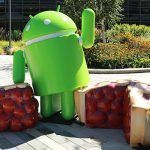 The phone launched with Android 8.1 Oreo on board, but an update to Android 9.0 Pie is already on the way. The Android phone comes with a 5.84-inch FHD+ display that supports HDR10. A capable Snapdragon 636 processor is coupled with 4GB RAM and 64GB internal storage. The Nokia 7.1 features a dual-rear camera setup with a primary 12MP sensor paired with a 5MP depth unit. The phone uses Zeiss optics for its lenses. 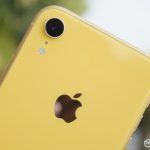 There’s an 8MP front-facing camera which sits in the rectangular notch. The Nokia 7.1 packs a rather small 3,080mAh battery, but it does support Fast Charging. A 3.5mm headphone jack, a USB Type-C port, and pure Android OS sum up rest of the highlights of Nokia 7.1. 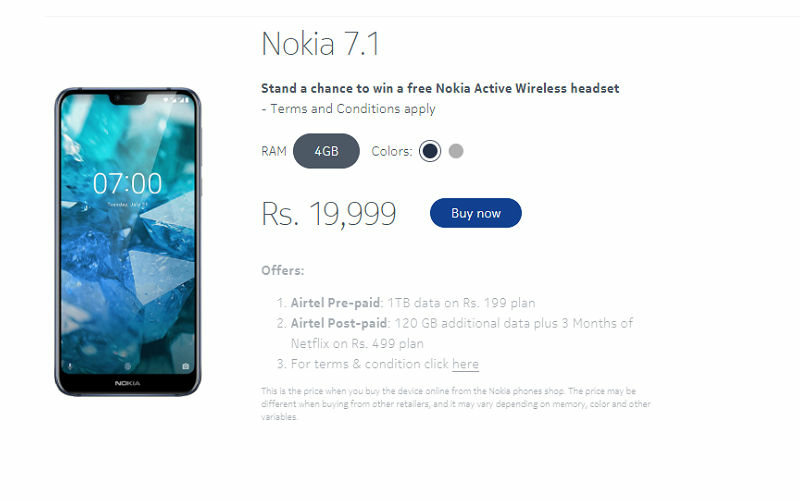 [Update] As of writing, Flipkart has once again updated the pricing of the Nokia 7.1. The Gloss Midnight Blue color variant is available for INR 19,584. Meanwhile, the Gloss Steel color variant is selling for INR 19,830.